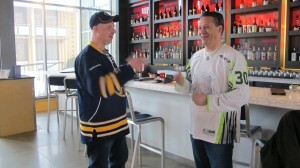 In keeping with my pre-game tradition, I chatted it up with a home team fan, getting him to answer 10 hockey trivia questions. This lifelong Sabres fan scored 6 1/2 out of 10 on my trivia questions, when I quizzed him at the hotel bar before the game. 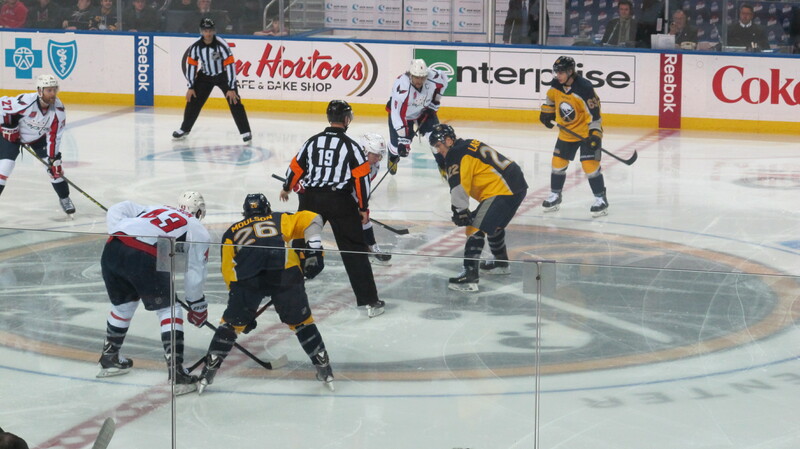 With the Sabres struggling this season, tickets were cheap for this game– $55 for Row 12 seats at the blue line. Great seats! 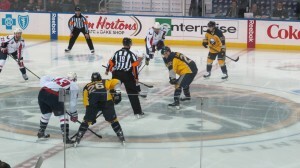 The game was announced as a sell out, but there were probably 1,000 empty seats at the First Niagara Centre in Buffalo. 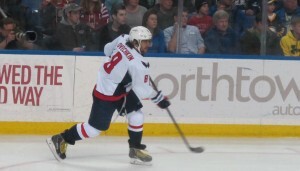 Of the fans in attendance, there were about 2,000 fans there to cheer on Ovechkin and the Washington Capitals, their game jerseys exceeding the number of Sabres jerseys in the stands. 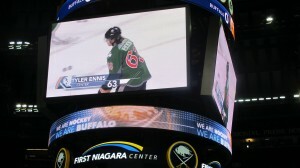 And speaking of jerseys, Here’s Edmonton-born Tyler Ennis (he scored the first goal of the game) wearing a St. Patrick’s Day jersey at the pre-game skate, these jerseys which will be auctioned off for a local children’s charity. 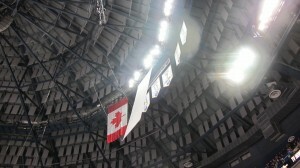 As the game was about to begin, I was touched to see (hear actually) the Canadian anthem sung at a game which featured to American teams. 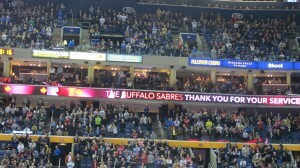 Later in the game, the Sabres included mention of Canadian troops, when they took the time to honour our men and women who serve in the military. 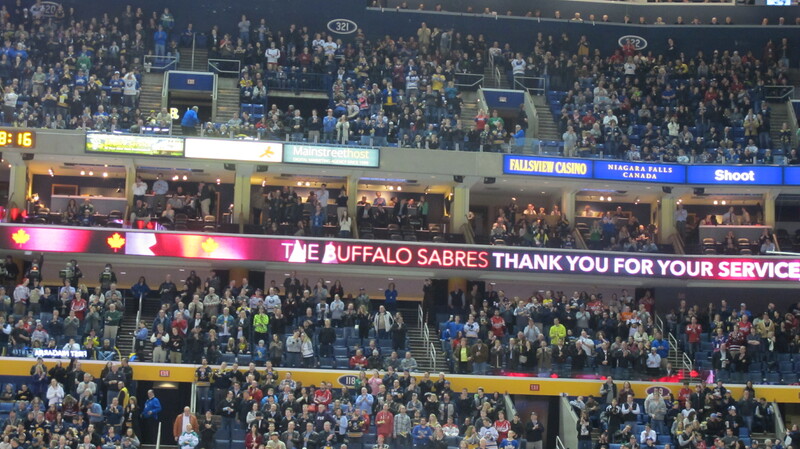 Very classy move on the part of the Sabres, who I’m sure appreciate the fan support they get from just north of the border. With the game underway, the Sabres scored first, and I was a bit surprised to see the small number of Buffalo fans who stood up to cheer. 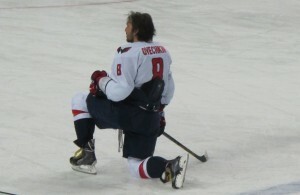 Perhaps indicative of a tough season, but maybe it’s always been that way? When Washington scored, every fan dressed in Capitals colours stood up to cheer, in contrast to the Wings-Penguins game the day before, where the Wings fans were a bit more subdued in showing their support for the visiting team. 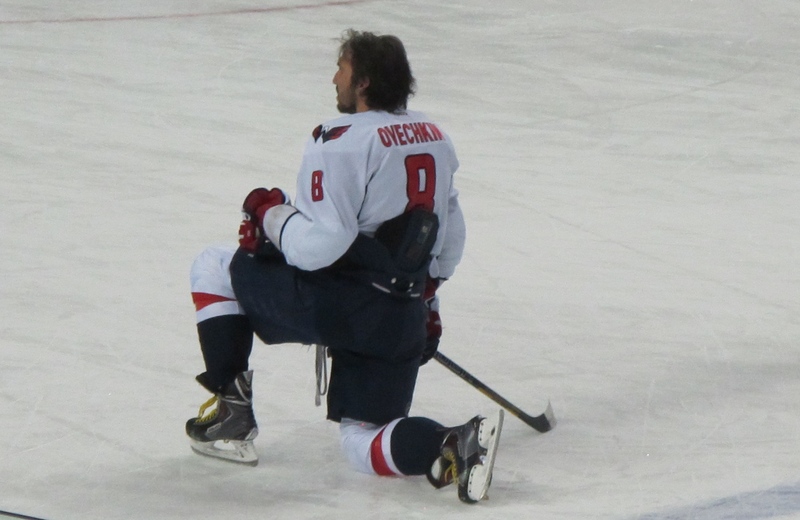 The game went back and forth, and was tied 2-2, before the Caps scored to make it 3-2 in the third. 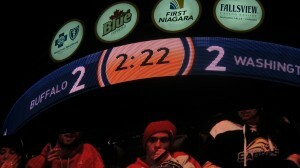 I was a bit surprised to see a number of fans leave with 8 minutes to go in the third period. 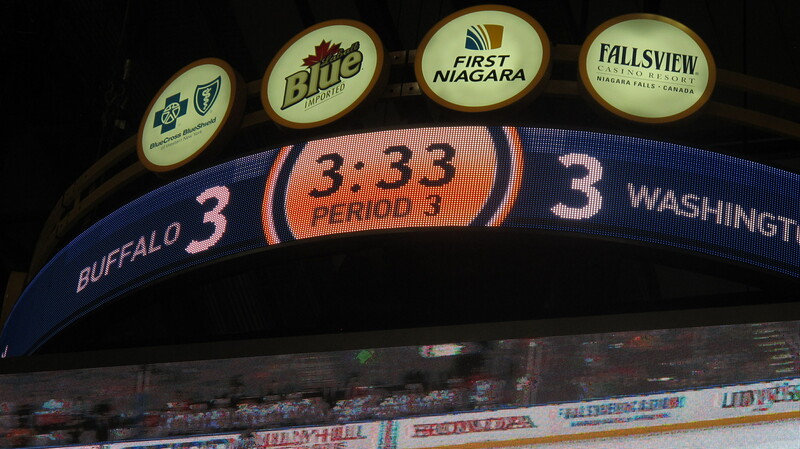 In a matter of two minutes (and with 6 minutes to go in the third period), the Sabres tied the score at 3-3, sending the game to overtime, and then a shoot-out, where the Capitals came out on top! 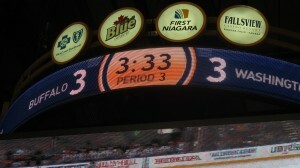 Very entertaining game, and I would be remiss not to comment on the First Niagara Center. After watching games in the beautiful facilities in Philadelphia and Pittsburgh, the Sabres had a lot to live up to. Buffalo can be very proud of their arena/entertainment complex, and as for the team’s woes on the ice, there are sure to be better times to come! 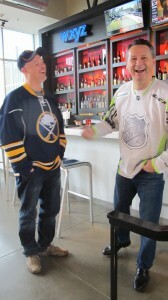 Just ask an Oilers fan about their team’s future prospects!